Today, I am featuring a book by a writing friend, Jo S. Kittinger. 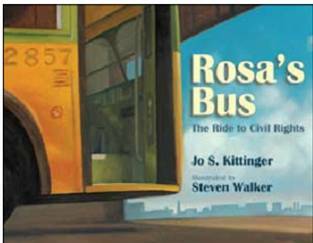 Rosa’s Bus was recently released by Boyds Mills Press. I met Jo a few months after I started writing for kids when I attended my first SCBWI conference. Jo was (and still is) the co-regional adviser for the Southern Breeze regional chapter of SCBWI. I took special notice of Jo’s books at the conference bookstore back in 2001 because they were nonfiction, and the subjects were perfect for my sons back then: rocks, dead logs, and birds. In addition to those books, Jo has written easy readers and has a picture book forthcoming from Peachtree Publishers titled The House on Dirty Third Street. To my mind, Rosa’s Bus is a perfect example of how an author can pitch a well-worn topic in a new way. A quick search of books about Rosa Parks available through Amazon.com yielded 120 results. At our recent SCBWI/Southern Breeze conference, I asked Jo to read from the book and to talk about why she approached a familiar subject in this way. Thank you Sarah, for sharing a little bit of my heart for Rosa’s Bus with your followers! It’s a joy counting you among my colleages and friends!